Quickly and accurately determine the screws size Recommends the drill bit or tap size needed for the screw Standard & Metric Constructed of thick hard plastic for lasting durability Smooth easy to clean surface that resists oil and grease #0 to 3/4" coarse and fine thread 1.6mm to 16mm metric A shop essential, this sturdy lightweight plastic gauge will easily fit in your shirt pocket or tool chest drawer. This is a must have for the professional mechanic or home hobbyist for quickly measuring those fasteners in your shop drawers. 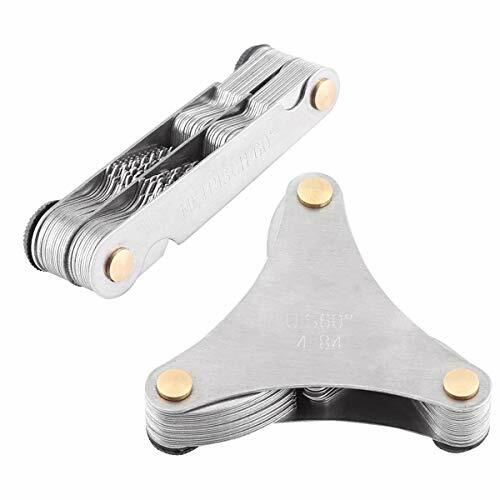 Useful for tool and die makers, machinists, screw machine operators and other mechanics to layout and check radii of tools, dies, etc. 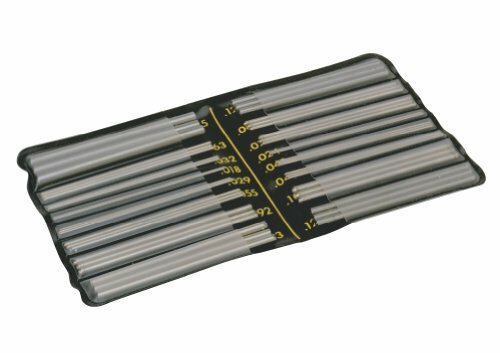 The Brown & Sharpe 599-4816 Thread Measuring Wire Set includes 48 wires in 16 different diameters three of each size for measuring and verifying the 60-degree pitch diameter on threaded fasteners that have inch threads from 3 to 48 threads per inch, metric threads from 0.5 to 6mm, and Acme threads from 3 to 16 threads per inch. A 1" long center section of each wire is ground to nominal size within 0.00015". The wires are steel for durability and are packed in a plastic pouch that has slots marked for each size. The set includes wires with the following diameters: 0.018", 0.024", 0.029", 0.032", 0.040", 0.045", 0.055", 0.063", 0.072", 0.081", 0.092", 0.108", 0.120", 0.127", 0.143", and 0.185". Thread measuring wires are commonly used in manufacturing, machining, and assembly operations. 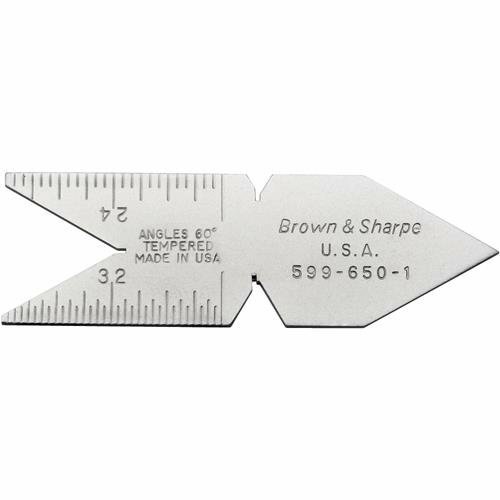 Brown & Sharpe manufactures precision measuring equipment and metrology hand tools. The company, founded in 1833, is headquartered in North Kingstown, RI. Handy guide to quickly check your bolt width and length. Nut posts let you check the size on both coarse and fine thread. The rulers on both sides handle both Standard and Metric measurements. Also, has thread pitches on the back! MATERIAL: All 52 pcs was made by stainless steel, not easy to rust. Ensure the accuracy of measurement. CONTAIN: Metric total of 24 tablets, according to the number of pitches per piece, said pitch 0.25-6mm. Inch total of 28 tablets, each in accordance with the number of teeth per inch to represent the number of teeth 4-62. UNBEATABLE SATISFACTION: GOCHANGE products are backed by an unmatched reliability and consistency, coming with quality assurance you can trust. If you meet any problems, just don't hesitate to contact us. 6.0, 5.5, 5.0, 4.5, 4.0, 3.5. 3.0, 2.5, 2.0, 1.75, 1.5, 1.25. 1.0, 0.9, 0.8, 0.75, 0.7, 0.6. 0.5, 0.45, 0.4, 0.35, 0.3, 0.25. 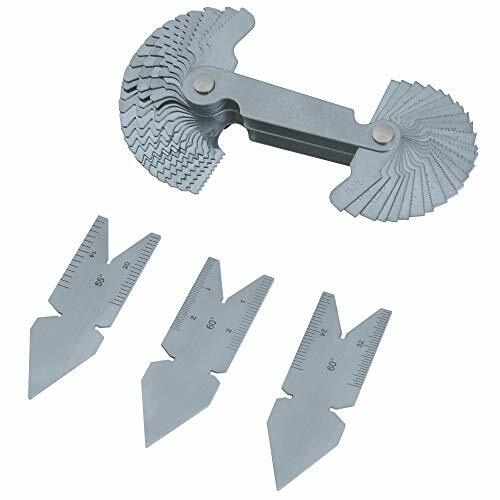 It is most useful for checking tool angle while cutting threads in metal turning lathes. 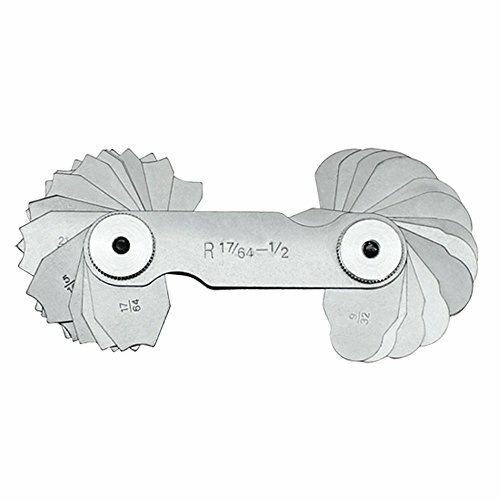 The angles on the thread cutting tool is checked on the V slots in the gauge. 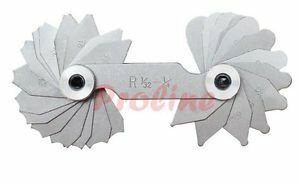 Screw thread pitch cutting gauge tool set. Typically used to check the thread size determination is correct. The thread Pitch Gauge used to measure the pitch of the thread and provide the correct size drill bit,or to size fastener to determine what bit should to use. Center Gage use to grind and position thread cutting tool on a lathe. Contains 55 Whitworth Systems and 60 Metric Systems. Thread Pitch Gauge measuring range from 0.25mm to 6mm. Made of Heavy duty gauge steel.Reliable quality to ensure accurate measurement data. 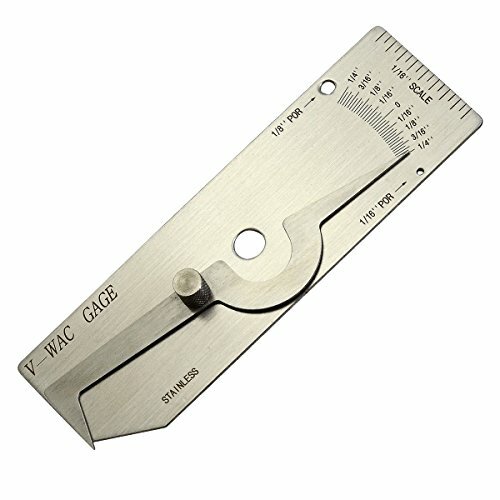 This Threading Gauge Is Tempered With A Satin-Chrome Finish. 60 Angles For All Standard 60 Threads, It Is Graduated 14, 20, 24 And 32 Divisions Per Inch To Show Double Depth Of Threads. Save a trip to the hardware store. Quickly check thread sizes. A must have for anyone who uses fasteners. Angled design with brackets. Can be table or wall mounted. 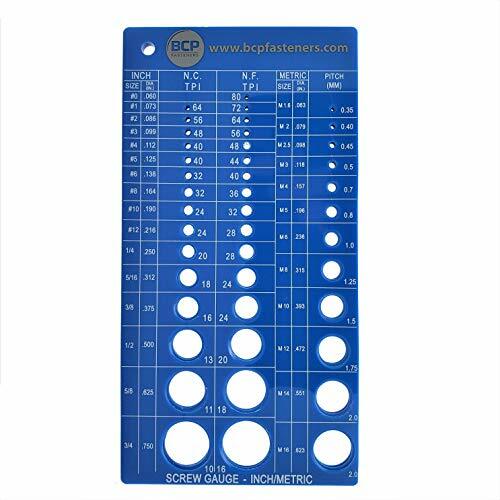 What You Get : In this thread pitch gauge kit, it include 51Pcs America SAE type, 52pcs metric and Inch type, 3pcs metric & america SAE type & British Whitworth, they are well packed in a plastic box, easy for carry and store. 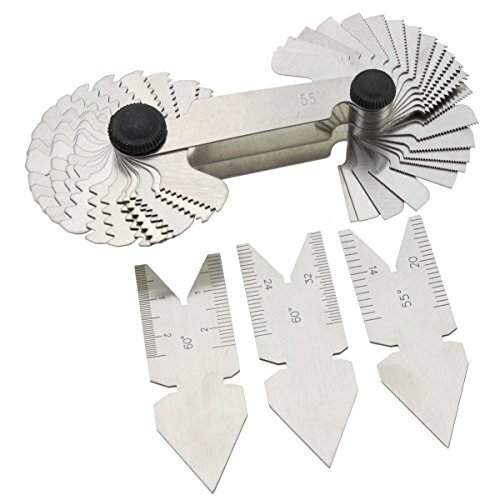 High Quality : All the thread pitch gauge are made of stainless steel, heat processed with chrome finish, high strength, good resilience, elegant appearance. Surface polished smooth, applying anti-rust oil to prevent rust. Measuring Range : 51pcs America SAE type measuring range is 4-84; 58pcs Metric & America SAE Type & British Whitworth Metric is 0.25-6.0mm, Imperial is 4G-62G US: 8, 10, 11, 14, 19, 28. 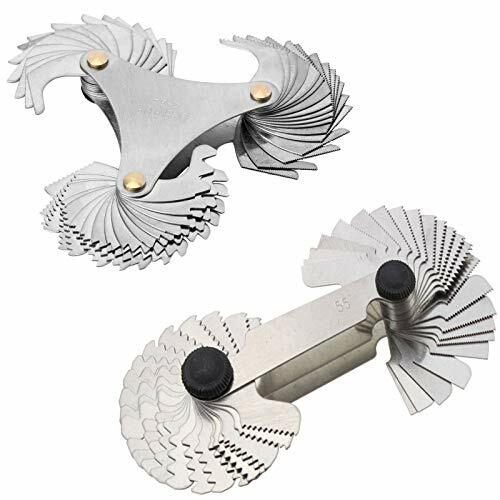 Easy to use : Designed with a hole on each end, use screw for easy adjust and disassemble, from where you press the tooth gauge, you can easily rotate the thread blades, numbers are stamped clear for read. Wide Application : They measure accurately and have almost no errors. Typically used to check the mold & machine & mechanical thread size determination is correct; Accurately measures internal and external screw threads with thread blades of varied size; Center Gage use to grind and position thread cutting tool on a lathe. -Is one kind of a pitch, the pitch multiple stacked up special measuring tools, thread pitch for inspection. - It is useful to check the tool angle when cutting threads on a metal lathe. - It is 55 Degree & 60 Degree Thread / Screw Pitch Gauge gage with lock up device. The thread Pilot Group as a template cards toothed steel thread in the measured workpiece, if not close together, the other for one, until snug. tooth shape is not accurate. 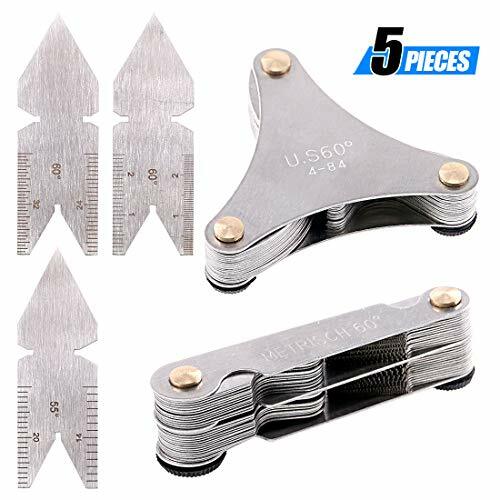 US 60Degree Thread gauge the degree of tooth-shaped model. Narrow-leaved designed to measure the external and internal threads - even in small holes. 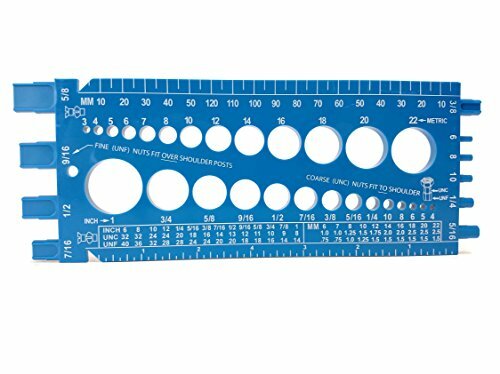 Quickly and accurately measure nuts, bolts, screws and washers Features a ruler marked with inches and millimeters USS, SAE, & Metric Constructed of 1/4" thick hard plastic for lasting durability Smooth easy to clean surface that resists oil and grease US & metric thread pitch gauge included on the reverse side. 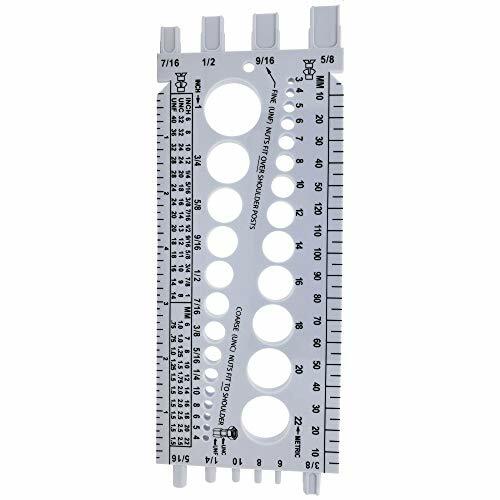 Special notch on the side for measuring flat head screws A shop essential, this sturdy lightweight plastic gauge will easily fit in your shirt pocket or tool chest drawer. This is a must have for the professional mechanic or home hobbyist for quickly measuring those fasteners in your shop drawers. 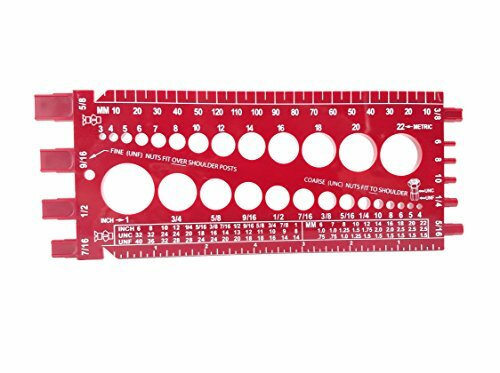 America SAE (51 pcs):60 * 60mm/2.36 * 2.36"
Metric+Inch (52pc): 67 * 20mm/2.63 * 0.78"
--Measuring rang: 0.25 - 6.00mm/0.0098" - 0.23"
The America SAE type thread pitch gauge has 51 pieces tablets.The metric and Inch type thread pitch gauge has 52 pieces tablets, 24 tablets of which are metric and 28 tablets of which are Inch. Accurately measures internal and external screw threads with thread blades of varied size. It worked perfectly to measure both screws and figure out what type of replacements. Made of stainless steel and processed with chrome finish, it combines high strength, good resilience, elegant appearance. It won't get rusted easily and owns long lasting durability. The toothed edges are sharply defined and the numbers are stamped and easy to read. 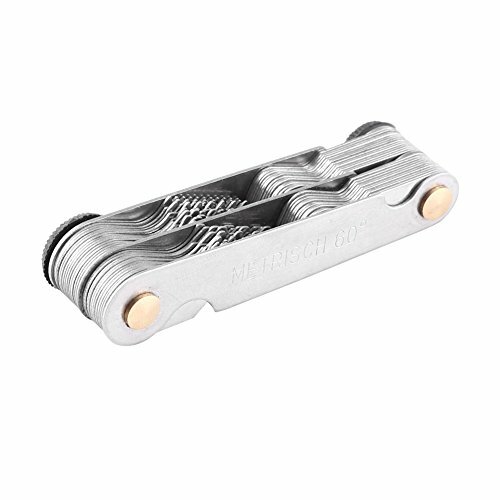 Designed with a hole on each end, from where you press the tooth gauge, you can easily rotate the thread blades. Applied to measure thread and external thread tooth pitch. The thread plug gauge, through quenching processing, strong hardness, head with a magnetic. Using rotary switch can be freely adjusted. Easy to use, light and delicate, with precise measurements and simple design, which can be widely used and durable. 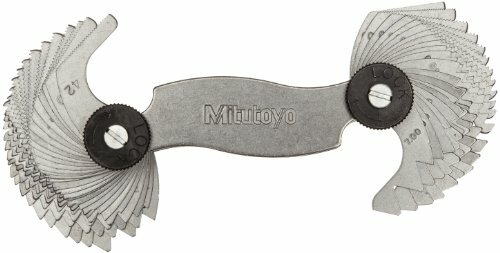 It is useful for checking tool angle while cutting threads in metal turning lathes.